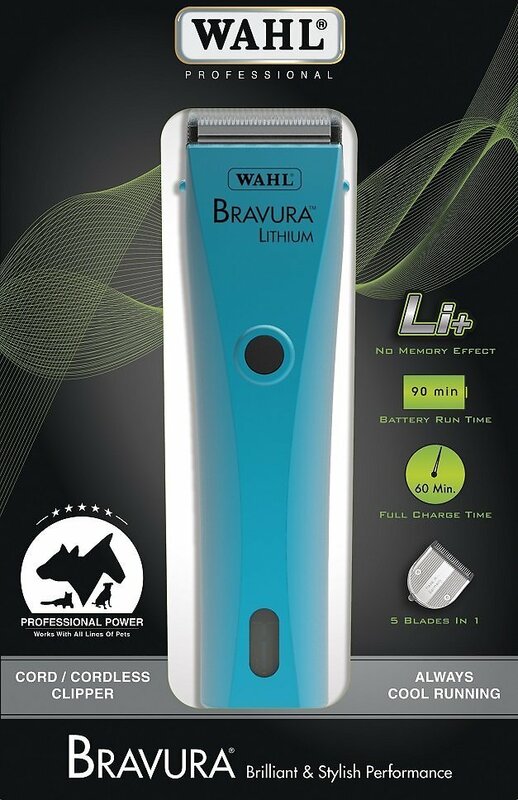 Get professional results at home with the Wahl Bravura Lithium Ion Cordless Dog & Cat Clipper Kit. Combining the power and durability of lithium battery innovation with the unsurpassed cutting performance of the adjustable “5-in-1” blades, it gives you all the power you need in a quiet, lightweight package. It’s specially designed for long run times of 90 minutes, and operates at full speed right up until the battery is completely depleted. And with a quick full charge time of just 60 minutes, plus the ability to use the clipper as a corded unit while charging, you never have to worry about lost clipping time. Offers 90 minutes of full speed run time with a quick charge of 60 minutes; can operate with a cord while charging. Versatile 5-in-1 blade technology adjusts the blade to sizes #9, #10, #15, #30 and #40. Integrated rapid power, lithium ion battery has no memory effect, meaning it charges new every time. Durable, lightweight and quiet kit runs with low vibration and no maintenance. Professional-quality powers up to 5,500 SPM and works on dogs, cats, horses, livestock and more. 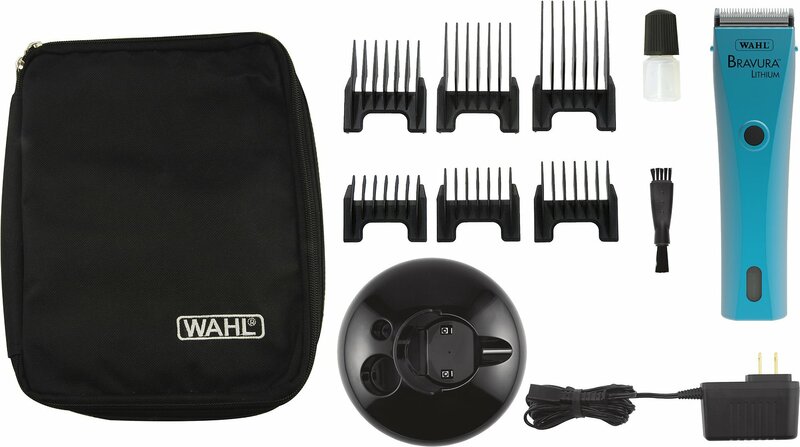 Professional Lithium Ion Cord/Cordless Animal Clipper, 5 in 1 Detachable Blade Set, (6) Attachment Guide Combs, Charge Stand & Charger, Soft Storage Case, Cleaning Brush, Blade Oil, and Instruction Book. Check blade teeth and oil blade before use. I only had this clipper for a short period of time. So far, I am very happy with it. I like that it can be charged and then works cordless. It's so much easier than working with an electrical cord attached. I use it on my miniature poodle. He has very dense curly hear. So, we'll see how long this clipper stays sharp. The first one I received arrived without a blade and it was broken and obviously a returned item. Chewy immediately sent me a replacement. The clipper works great and is also quiet. I would definitely recommend this clipper. What a blessing to use, so easy and no cord to get tangled up. Light and quiet and cool. A must for home groomer or professional groomer. Love them would order again. So easy to use.So quiet. Soo cool. They are light. Being cordless is definitly a plus. Very smooth cutting. Just a side note: my daughter used them on my son in law and grandson. Lol. They did a great job. I had just about given up on clippers. Had previously ordered an Andis on many very good recommendations. Terrible, noisy, and heavy. Sent it back. No cutting power at all. The Wahl was a chance I took and so glad I did.worked like a chamr. Light,quiet, and cuts like a dream and the dog couldn’t be happier. Would diffently recommend.